We experimentally and theoretically demonstrate the purity (polarization) control of qubits entangled with multiple spins, using induced dephasing in nuclear magnetic resonance setups to simulate repeated quantum measurements. We show that one may steer the qubit ensemble towards a quasiequilibrium state of a certain purity by choosing suitable time intervals between dephasing operations. These results demonstrate that repeated dephasing at intervals associated with the anti-Zeno regime leads to ensemble purification, whereas those associated with the Zeno regime lead to ensemble mixing. via Phys. Rev. Lett. 105, 160401 (2010): Zeno and Anti-Zeno Polarization Control of Spin Ensembles by Induced Dephasing. 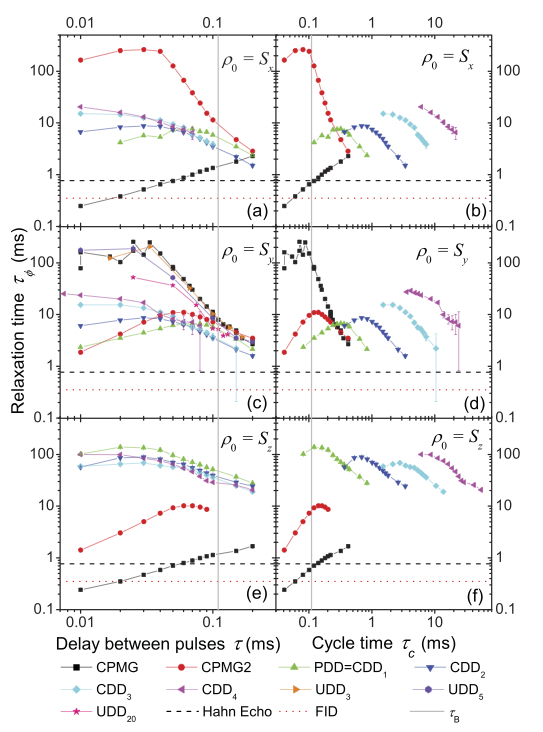 Time evolution of the system (S) spin polarization. The main panel compares S-spin polarization interrupted by repeated measurements at intervals of 1 ms (blue upper triangles) and the evolution interrupted at 0.2 ms (red circles), respectively. 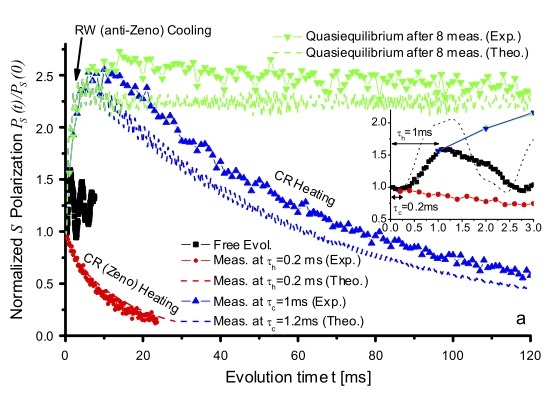 A quasiequilibrium state is achieved for the 1ms measurements, stopped after 8 ms and followed by free evolution at later times (green lower triangles). The S spin free evolution is shown with black squares. The inset zooms the dynamics for short times. The theoretical curves (dashed lines) are obtained by exact diagonalization of the Hamiltonian for the experimental parameters above. via Quantum thermometers usher in the big chill – 06 October 2010 – New Scientist. This entry was posted in Press and tagged research, science. Avoiding the loss of coherence of quantum mechanical states is an important prerequisite for quantum information processing. Dynamical decoupling (DD) is one of the most effective experimental methods for maintaining coherence, especially when one can access only the qubit system and not its environment (bath). It involves the application of pulses to the system whose net effect is a reversal of the system-environment interaction. In any real system, however, the environment is not static, and therefore the reversal of the system-environment interaction becomes imperfect if the spacing between refocusing pulses becomes comparable to or longer than the correlation time of the environment. The efficiency of the refocusing improves therefore if the spacing between the pulses is reduced. Here, we quantify the efficiency of different DD sequences in preserving different quantum states. We use 13C nuclear spins as qubits and an environment of 1H nuclear spins as the environment, which couples to the qubit via magnetic dipole-dipole couplings. Strong dipole-dipole couplings between the proton spins result in a rapidly fluctuating environment with a correlation time of the order of 100 μs. Our experimental results show that short delays between the pulses yield better performance if they are compared with the bath correlation time. However, as the pulse spacing becomes shorter than the bath correlation time, an optimum is reached. For even shorter delays, the pulse imperfections dominate over the decoherence losses and cause the quantum state to decay. via Phys. Rev. A 82, 042306 (2010): Performance comparison of dynamical decoupling sequences for a qubit in a rapidly fluctuating spin bath. Relaxation times of different initial conditions under DD conditions as a function of the delay between pulses τ (left panels) and the cycle time τc (right panels). From top to bottom the initial condition is given by S_x, S_y, and S_z respectively. An optimal τ and consequently τc is observed for each sequence. The reduction of the relaxation time to the right side of the optimal value is due to the shifting environment: in this regime the cycle time is longer than the correlation time of the bath, τc > τB . The reduction for short cycle times indicates that in this regime, accumulated pulse errors dominate.